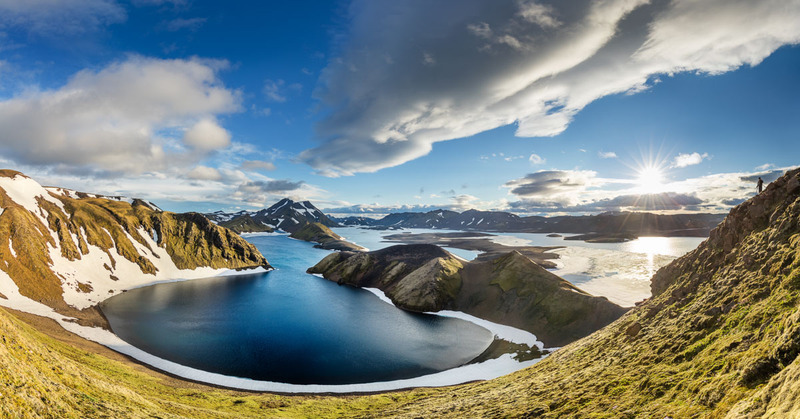 Langisjor, a 30km lake in the Icelandic Highlands is one of the world's most beautiful and remote landscapes. I led a group of four photographers through this remarkable wilderness in the 'summer' of 2015. Langisjor first captured my imagination in 2011 when I first spotted it on Google Earth. Two years later I planned a backpacking trip there, which I ultimately bailed on due to a bad weather forecast. Then in 2014 I flew over it with a workshop group and, after seeing it from the air, started planning. 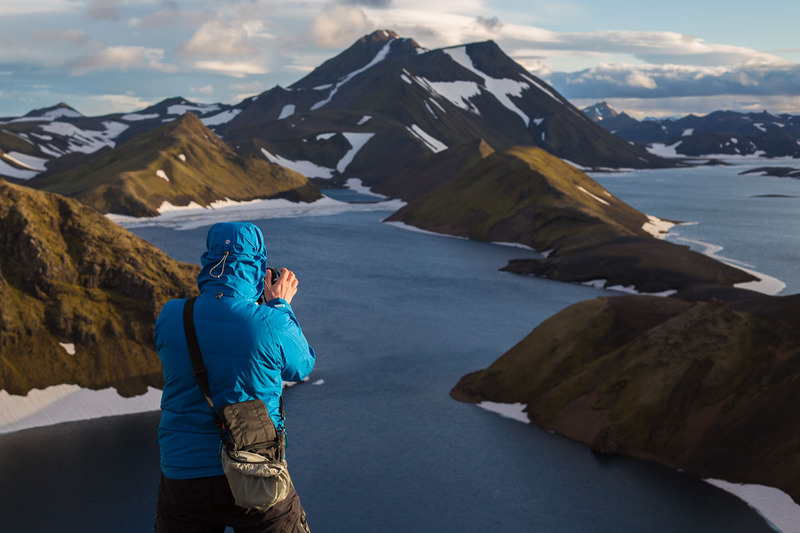 In 2015 I arranged a workshop with a group of keen hikers/photographers to go on an adventure to Langisjor walking the 30km length of the lake. Before the clients even arrived I had a few concerns. 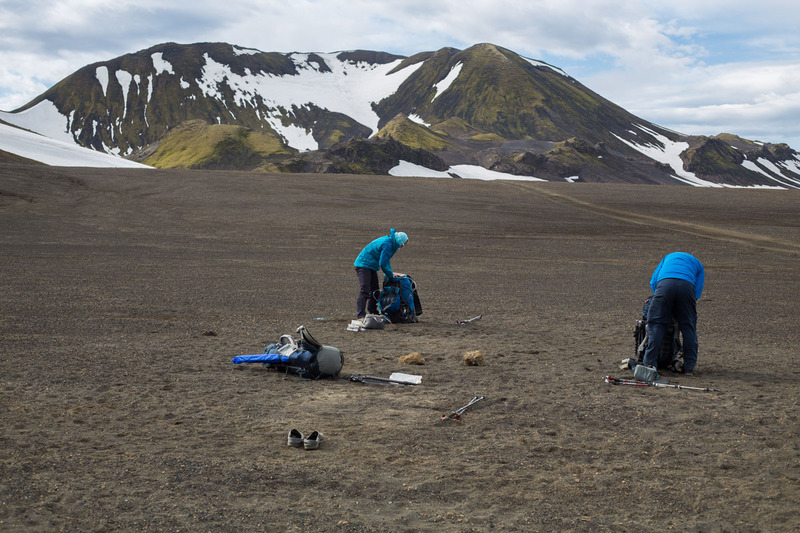 I’d spent that week hiking in the Landmannalaugar area with my girlfriend Emily and it was obvious that the snow was exceptionally late. As the workshop approached it looked like we would never reach Langisjor. With the roads authority keeping a few of the highland roads shut there would be no way to get there. Luckily, when I met the clients, Sean, Marie, Marcus and Adam, I was able to inform them that the roads would open that day and our driver had gained special permission to trail blaze the final track to Langisjor. The drive was enjoyable, especially for the clients, all of whom were Iceland virgins! Throstir, our driver, kept us entertained with Icelandic stories whilst occasional stops at petrol stations granted us immediate rock star status as we dismounted the gigantic vehicle. 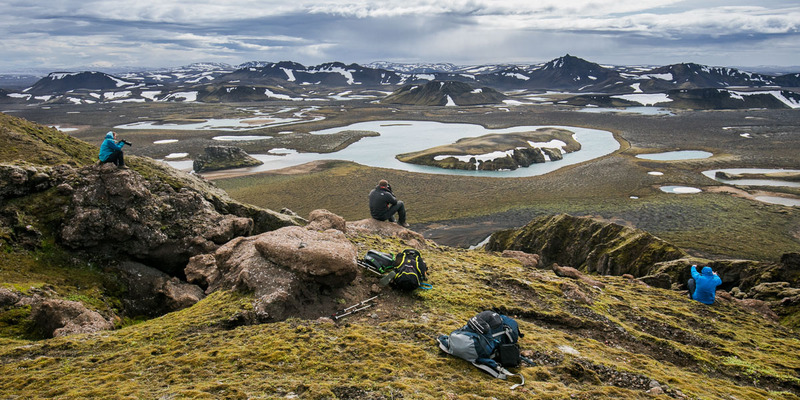 The journey became particularly interesting on the final track to Langisjor. Collapsing snow bridges left the tyres a few feet below the rest of the snow and we would sporadically hop out to dig a ramp. Throstir kept changing the tire pressure eventually going all the way down to 4 psi. It was slow going but a great experience. Langisjor seen from a hill to the NW. A completely different prospect to the aerial view taken almost exactly a year earlier! 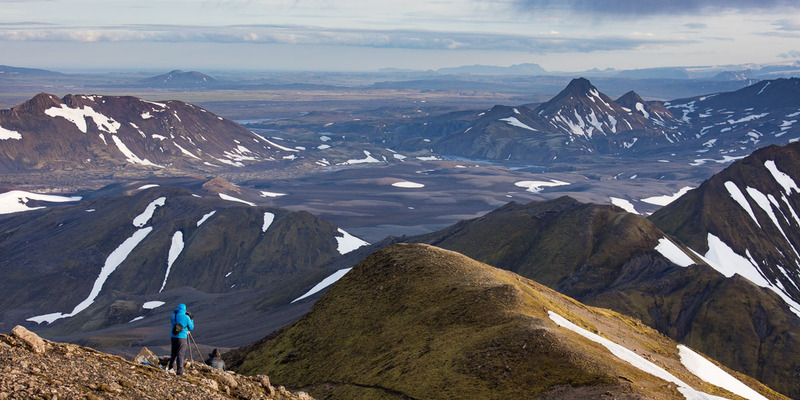 By the late afternoon we had reached a high point and Langisjor burst into view – it was both spectacular and alarming. The Super Jeep could go no further with vast fields of snow making the route impossible. On the opposite side of the lake at least some of the hiking route was under massive drifts of snow. Add to that a bitter wind and it’s fair to say that Langisjor wasn’t welcoming us with open arms! It’s not easy changing a plan that you feel committed to, but realistically there was no option but change the route. 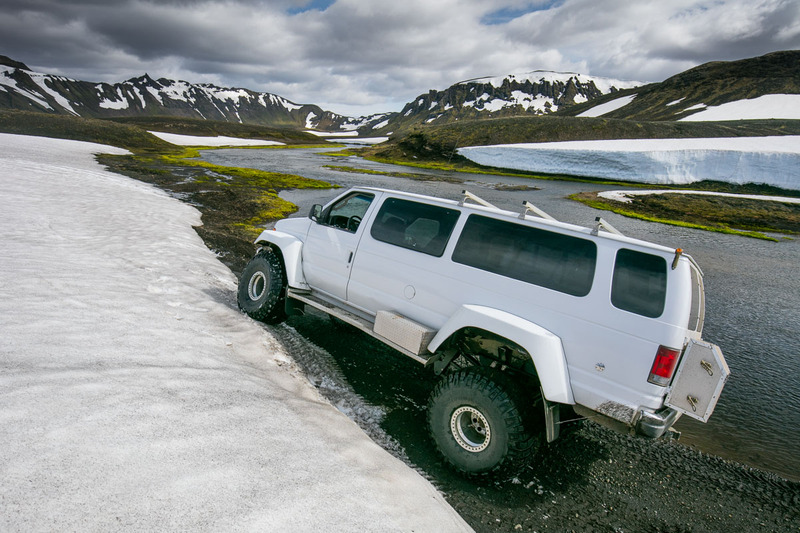 We hopped back in the Super Jeep and drove back to the south end of the lake to make camp. That evening we headed up Sveinstindur in the hopes of a sunset. Fortunately the slopes were mostly snow free, but towards the top I had to spend some time kicking steps into what was increasingly icy snow. Not much to see on the summit! Langisjor revealed – not the sunset we had been hoping for, but a remarkable sight. The following day I was up for sunrise, but there was complete cloud cover. Later in the morning we packed up and started to hike along the lake. Packing away at our first dusty camp! Sean, Marcus and Adam on their way up a snow slope. I had no specific plans for a campsite but Iceland is generally very forgiving in terms of finding good ground for a tent. The main challenge was finding a bit of wind protection should the weather pick up overnight. 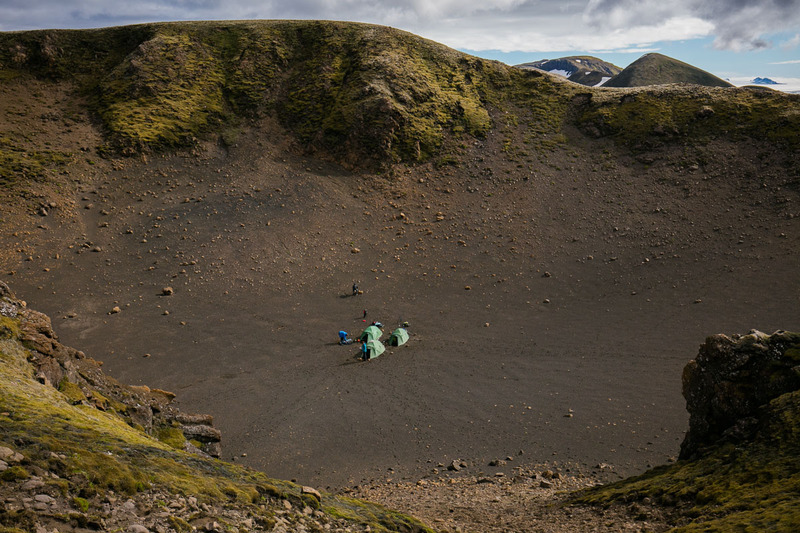 Sean, a professional sky diver and pretty much game for anything, spotted a crater and immediately suggested camping in it. How could I refuse? As luck would have it, not only did this prove to be a good camping spot, but it was also immediately next to an outstanding viewpoint. We were treated to some excellent light that evening. It was a special end to the day – the kind of scenery and light that can really justify a trip like this and having it all to ourselves made it all the more perfect. Written by alexnail, posted on 5th February 2016 at 5:59 pm, in Trip Reports. Permalink. RSS feed for this post. 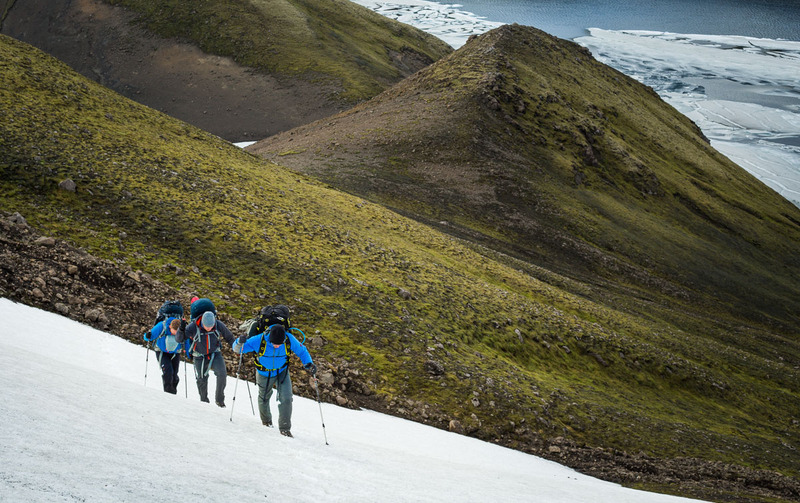 I’ve read this story and it’s really amazing the adventures you’ve been through in Iceland. I’m a photographer as well and I really want to visit Iceland, amazing landscapes indeed, I’ve never seen something like that. Congrats in your blog and keep posting! Thanks Alex, glad you enjoyed it. 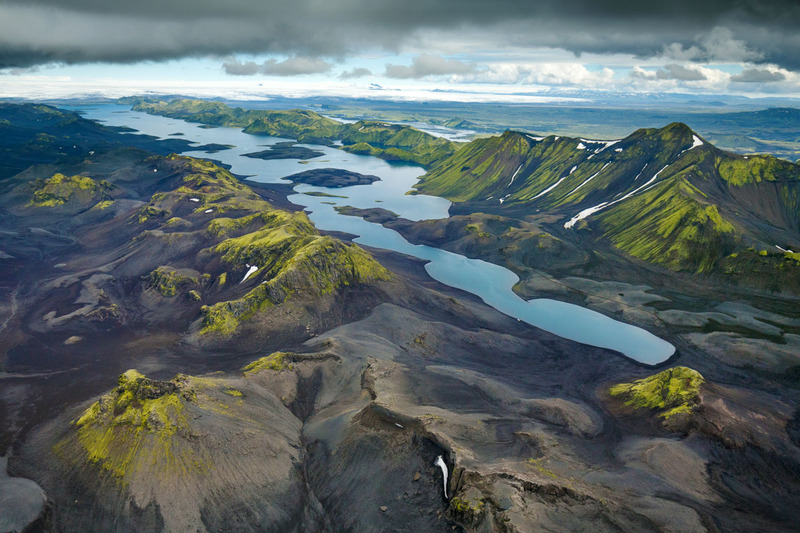 There are certainly many reasons why Iceland has become a popular photography destination. your impressive photos inspired me enough to visit Iceland next summer. Is it possible to share your GPS data of your trail? I don’t record GPS routes except on specific occasions for my own use. Enjoy Iceland!